The building complex of 200sqm. is a family vacation house while its functional program is divided into three modules, which consist of the guestroom, the main house and the office. Our attempt is to create an open cavity in the ground, which coincides with the meaning of the void. The formation of the void is implemented through three cognitive tools, which are described in succession as contact, intersection and distance, while being in correspondence with the three sections of the building complex. The first spatial gradient is associated with the mental tool of "contact" and grows between the guestroom and the void as an outdoor seating area under the shade of the wooden beams and an old olive tree. 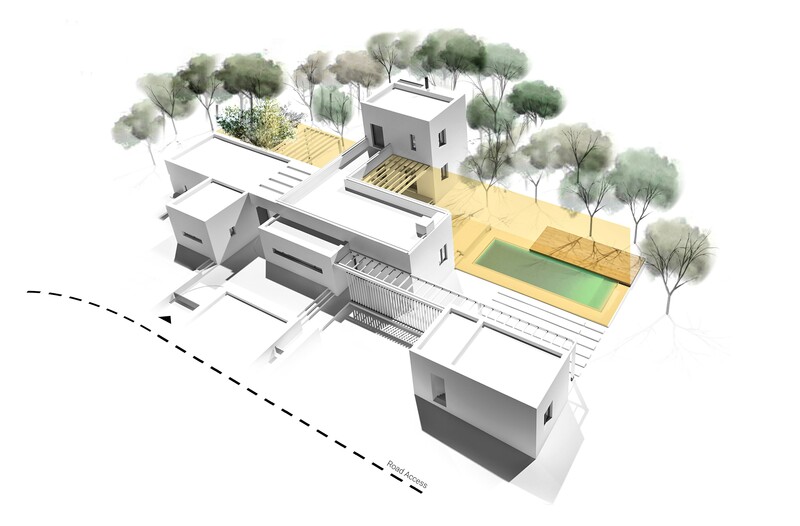 The second spatial gradient is associated with the mental tool of "intersection" and grows between the main house and the void as a bridge on the first floor and a semi-outdoor space at the ground floor for the functional connection of the house. 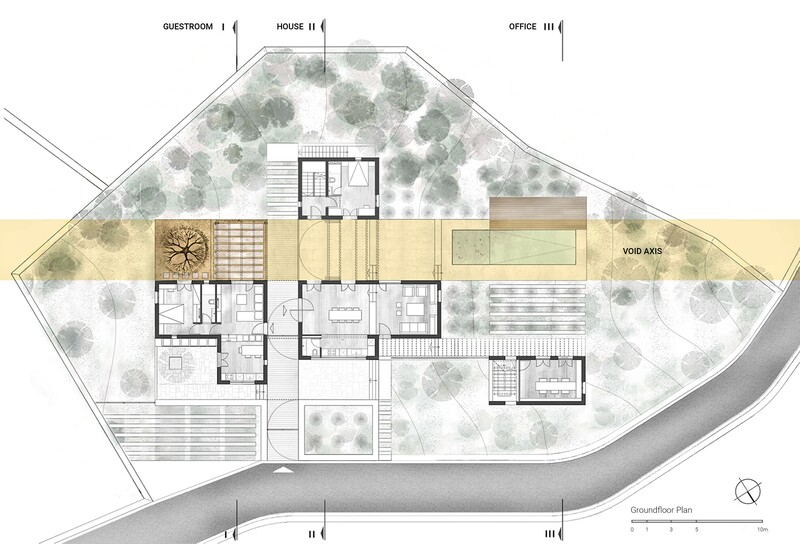 The third spatial gradient is associated with the mental tool of "distance" and developed between the office and the void as a courtyard area of the swimming pool. 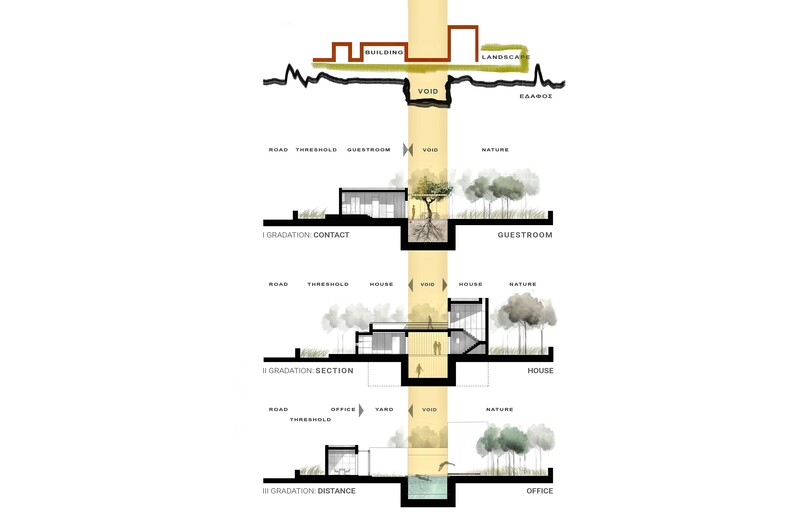 Therefore the void is described as an open platform of activities which narrates multiple spatial gradients for the familiarization of space, both in relation to the natural landscape and to the building complex as a whole.